Henry Frey—Floyd St.; Margaret Linehan, 20, Floyd St.
Harry Kieselstein, 23—Fulton ; Marion Fishkoff, 21, Wyckoff Av. Louis Getrovsky, 24, Williams Av. ; Jennie Cohen, 19 S. Elliott Pl. Charles H. S. Erving, 112 5th Av. ; Anna T. Nicolay, 28 (?) 132 5th Av. Harry Rosenblum, 28 (?) Division Av; Martha Keslow, 22 Floyd St.
Izidor Hertz, 22 E. 4th St. Manhattan; Ray Brodkin, 20, 22 Bartlett St.
Louis Epstein, 22, Prospect Pl. ; Lena Gieger, 20, Prospect Pl. Samuel Smolensky, 26, Leonard St., Bassia Yurkovcizky/Yurkovclzky, 21 Leonard St.
Moses Goldsmith, 2_, Varet St., Anne Hyman, 22 Lynch St.
Albert Wolf, Myrtle Av., Louise Hocker, 26 Manhattan Av. Frederick H. Fecher, 27 E. 4th St., Manhattan; Florence Bennett, 22 Marcy St.
Isidor Sarch, 21, Blake Av. ; Fannie Berger, 20 Blake Av. Gershon Klein, 25 Fulton St., Ida Levinson 23, Fulton St.
Charles A Jaeger, Bainbridge St.; Augusta Ku____, Burgenfield, N.J.
Alexander Barkan, Coney Island Av. ; Emma Bernstein, Coney Island Av. Robert C. Klumpp, Flushing Av. ; Lena Friebe, Knickerbocker Av. David Gutienpien, 24, Pearl St.; Rose Stanik/Slanik, 22; Pearl St. The list contains 2300+ names of persecuted students. 1900+ students indicated on their enrollment cards that they were Jewish. Additional students were persecuted on political grounds and were not Jewish. There are language buttons at the top of the page for English and German. A list of marriage licenses appeared in the March 29, 1918 edition of The Brooklyn Daily Eagle. Included are the names and addresses of the individuals, many of whom are Jewish. There is another number which may be the person’s age. Abraham Langer, Ida Borish, Harold Dietrichen, Lilian Dreacher, Harry Miller, Beckie Berlin, Max Pinetzky, Mamie Shipper, George Stevenson, Josephine Bucksbaum, George Budesheim,Philip Weberman, David Cohen, Diana Buchbaum, Abraham Kramer, Bertha Brouchit, Dora Reichel, Louis Touber, Dora Cohen, Nathan Schefer, Rachel Taub, Regina Forsick, Sam Weinstein, William Frey, Ike Kaplan, Samuel Perry, Rose Greenberg, Isadore Wolotsky, Minnie Palley, Joseph Uberman, Rachel Zalatrefski, Harry Berger, Sarah Liebowitz, Esther Holas, Morris Levinowitz, Simon Elkind,etc. Please see the list for additional names. Listed in the NY Times on July 10, 1917 is "An Eligible List For Principals of Evening Elementary Schools" for the 1917-1918 school year. The article can be found at: query.nytimes.com/mem/archive-free/pdf?res=9905E6D7133BE03ABC4851DFB166838C609EDE. There are quite a few Jewish names on the list. Toward the end of the film there are brief views of the decimated Jewish cemetery. I. Reichman: menswear, Warsaw, 19 Krzyska St.
Elias Feigenbaum: Lodz, Warsaw, Gdansk—trips, customs, etc. A friend of mine’s great grandfather (my friend is about 68) kept a notebook of insurance sales and rentals, among other things. The book probably dates from the late 1890’s-early 1900’s, based on three dates (1899, 1900, & 1902) appearing in the information towards the end of the book. Last names and addresses are listed, covering New York City, Brooklyn, and New Jersey. The following information is based on handwritten data found in the notebook, “Memoranda”. (The spelling of names is as written). I believe the addresses are both residential and commercial. My thanks to Dr. J.Z. for so generously sharing his family’s treasure trove. 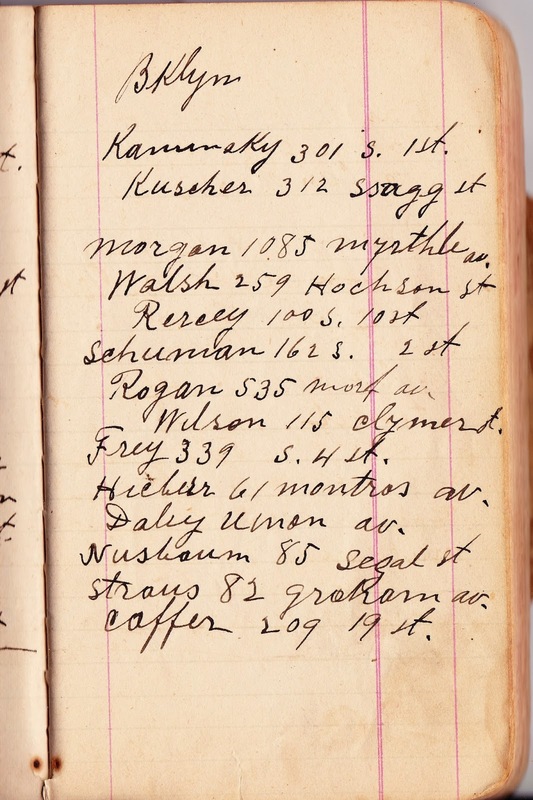 Below is a partial list of names & addresses of individuals who may have been Jewish. c/o Korfman 302 E. 88th St.
Ketaus--c/o Cohen & Co. , corner 4th St. & Washington Av. Dr. Tanner--353 E. 116th St.
Hamer & Alter--27 1/2 Essex St.
Goldman & Bucstaler--158 Rivington St.